English issue with articles from earlier editions, as well as new articles written especially for this issue. 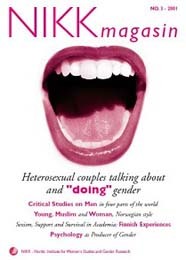 The main article discusses how heterosexual couples talk about and “make” gender. Another theme is the discrimination of women in teh academic field: what support systems can one use, and what survival strategies do women in this world use?